Megan is a director in the affordable housing and community development practice in the New Orleans office. Her practice includes commercial finance, real estate finance, public finance, corporate finance, and corporate transactions. Megan has experience representing investors, borrowers, lenders, and public bodies in the structuring, negotiation, and documentation of credit facilities and bond transactions. Megan has represented clients in numerous commercial transactions utilizing a variety of government incentives, including state and federal new markets tax credits, state and federal historic rehabilitation tax credits, low-income housing tax credits, opportunity zone investments, Louisiana film tax credits, Louisiana angel investor tax credits, state and federal renewable energy tax credits and grants, community development block grants, HUD-insured loans, tax credit bridge loans, and tax credit bonds. 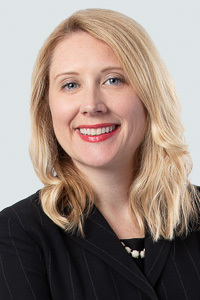 Megan has also represented clients in corporate matters such as formation, equity financing, negotiation and drafting of operating agreements and other organizational documents. Megan is a member of the American Bar Association, the Delaware State Bar Association, and the Louisiana State Bar Association. She has been included in the Best Lawyers in America © list (2016-2019) in the area of real estate law, ranked in Chambers USA: America’s Leading Lawyers for Business for banking and finance, in the area of Public Finance (2012-2018) and selected to the Louisiana Super Lawyers list (2011-2019) and frequently lectures on government incentive programs. She served as Chair and Vice Chair of the Government Incentives Committee for the ABA’s Real Property, Trusts and Estates Section, a member of the Diversity and Inclusion Committee for the ABA’s Real Property, Trusts and Estates Section and the President of CREW New Orleans. Author, Opportunity Zones, Chambers 2019 Global Practice Guide (Real Estate), pending publication. ABA Real Property, Trust and Estate Section Spring Leadership Meeting, May 2014, Eager Client Needs a Loan: Who, What, Where, When and How? Author, Noncompetition Clause Invalidated Due to Superfluous Language, Louisiana Bar Journal, Vol. 57, Number 4 (December 2009/January 2010). The New Orleans Redevelopment Authority (NORA) as lender in new markets tax credit transactions of over $50 million of Community Development Block Grants dollars into new markets tax credit and historic tax credit financings for its redevelopment programs in New Orleans and the NORA strategic acquisition fund. Projects include the Bayou-Treme Arts and Education campus, Odyssey House renovation of the Bohn Ford building, New Orleans Mission housing development for the formerly homeless, Whole Foods-Refresh project, and the headquarters for the New Orleans Jazz Orchestra. Bernard Project, nonprofit developer of affordable housing in (i) acquisition, development, financing, sale, leasing and compliance matters for the organization’s various affordable housing programs, including use of HOME and NSP funding; (ii) acquisition, financing and development of headquarters building using CDBG funds, new markets tax credits, developer equity and commercial debt; (iii) acquisition, development and financing for scattered site affordable housing project using low income housing tax credits; and (iv) acquisition, development and financing of multi-family residential development using low income housing tax credits. Home Bank, tax credit investor and lender in various types of real estate developments involved government incentives, including the $10 million development of a new academic facility for Thrive Academy in Baton Rouge, LA. IberiaBank, tax credit investor and lender in various types of real estate developments, including multifamily housing, scattered site housing, hotel, office buildings and other mixed use residential and commercial buildings. Lender in various real estate developments, including a $130 million financing of hotel, residential apartments and parking garage using conventional financing, federal and state new markets tax credits and federal and state historic tax credits, $20 million expansion of senior housing facility and three phases of a $30 million medical campus for orthopedic, behavioral health and pediatric facilities. Stirling Properties, LLC, developer in $27 million financing of a shopping center in New Orleans, LA, using new markets tax credits. Associated Enterprises, LLC, terminal company as QALICB in new markets tax credit financing of its office and terminal headquarters in Convent, LA. Buccini/Pollin Group, developer in multiple historic tax credit transactions in Wilmington, DE, including the redevelopment of the iconic Nemours Building and Hotel DuPont. Represent developer in office building sale. Wankawala Organization, developer in $50 million hotel renovation in Philadelphia, PA using commercial debt, SBA financing and federal historic tax credits. KFK Group, developer in $125 million historic rehabilitation of One Main Place office and hotel building in Dallas, TX, combining commercial debt, developer equity and state and federal historic tax credits. AMCREF Community Capital, a community development entity which has received over $380 million in new markets tax credit allocation in various transactions, including a $112 million financing of the acquisition and development of a biosuccinic acid manufacturing facility in Lake Providence, LA using new markets tax credits, USDA guaranteed bonds and a US Department of Energy grant; $83 million financing of a renewable energy power plant in Lumberton, NC using new markets tax credits, commercial debt and EB5 financing; and $53 million financing of a denim manufacturing plant in Vidalia, LA using new markets tax credits, USDA and SBA loans and a City of Natchez grant. Dudley Ventures Community Investment Group, a community development entity, in financing of the Salvation Army Center of Hope Campus in Birmingham, AL.